easyQuizzy for Windows XP - utility for generating various tests. The application can work with user data, allows you to import textual formulas and raster images, includes the ability to create questionnaires with different choices. The utility allows you to set the time for the passage of the entire block of tasks or separately for each, uses password protection and is able to compile the executable file of the test. The program has a simple user interface, does not require the connection of additional libraries, allows you to generate a block of tasks using a step-by-step wizard. 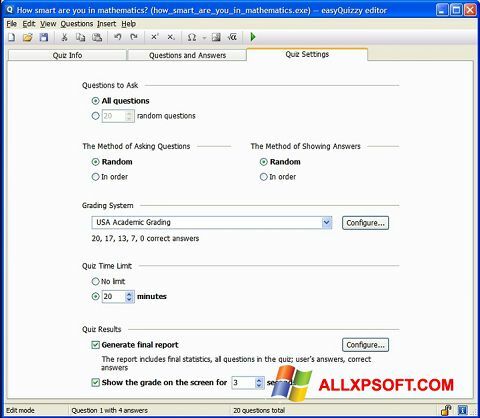 You can free download easyQuizzy official latest version for Windows XP in English.